I can’t say that the big day has finally arrived, as it has actually come around very quickly. 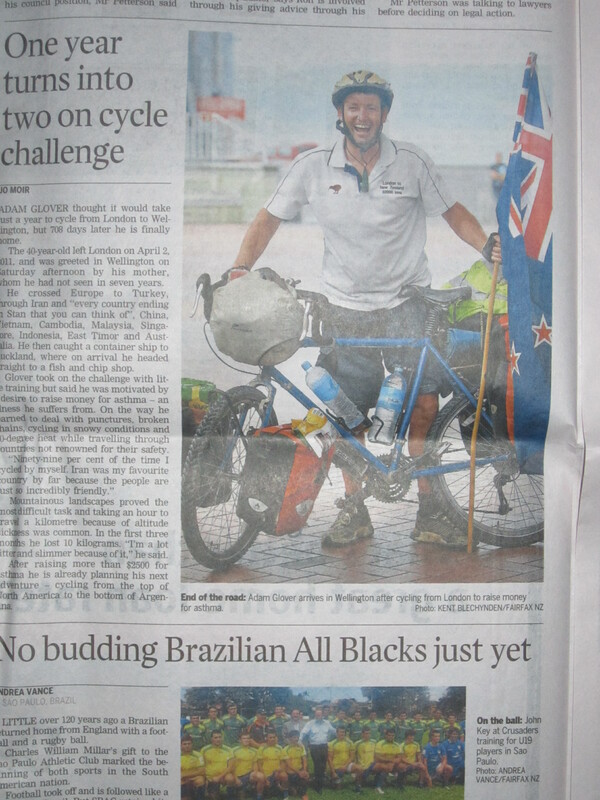 Having cycled into Wellington on the 9th March 2013 it is nearly exactly 2 years to the day that I cycled out of Wellington, picking up where I had left off, with a new challenge and some new goals. Not so new – is my original and trusted bike – The Surly Long Haul Trucker, which after a major overhaul is going to be used again. Unfortunately, sponsorship has been near impossible so 60 % of my equipment from my original trip is coming too. I had only planned on a low key departure. Felt very humble when my neighbours came out to say goodbye with balloons, a placard and just after 7:30 a.m. 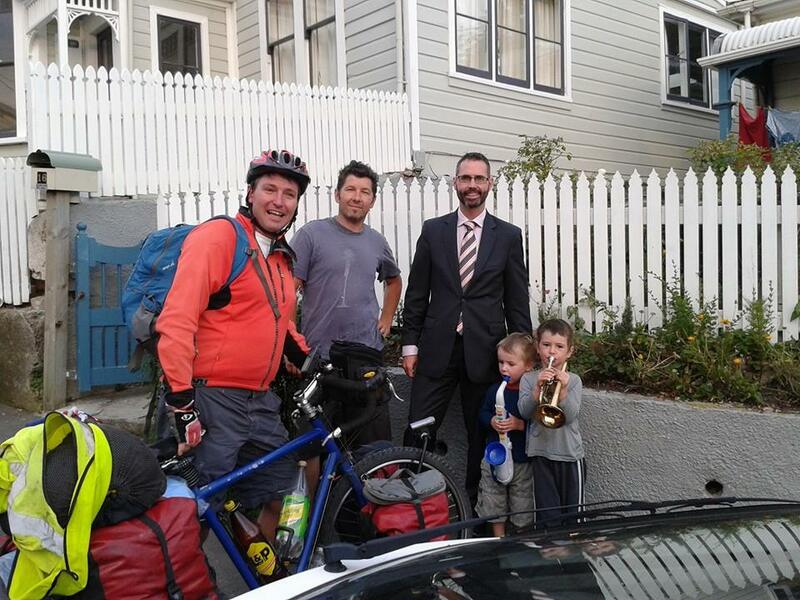 I was trumpeted off by Edric who played the trumpet to mark my departure and the start of what I hope will be a wonderful two year adventure. The first bit was easy cycling down Brooklyn Hill. It was deja vous…………. Just like when I started in London. A cyclist pulls up at the first set of lights with me………. and asks where are you going with that heavy load. Are you touring the whole of New Zealand? 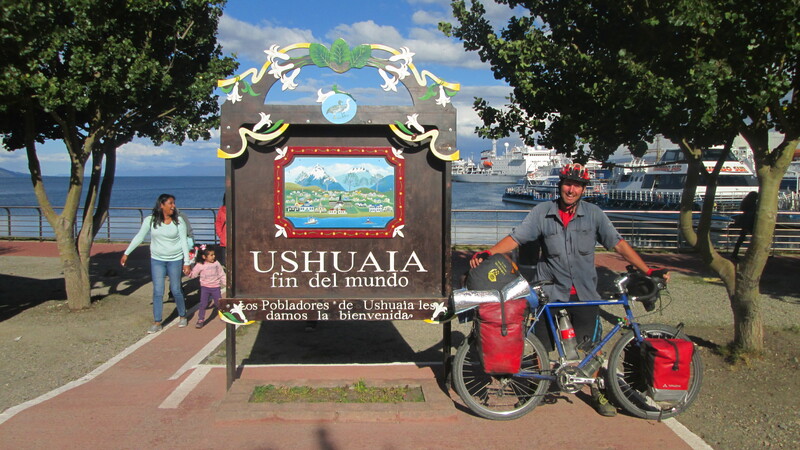 As soon as I told him I am cycling to Alaska …….the surprise and then enthusiasm was evident. I really could have done with just easing into it. Having cycled through the city the first real hurdle was to cycle up Naranga Gorge, New Zealand’s steepest motorway. 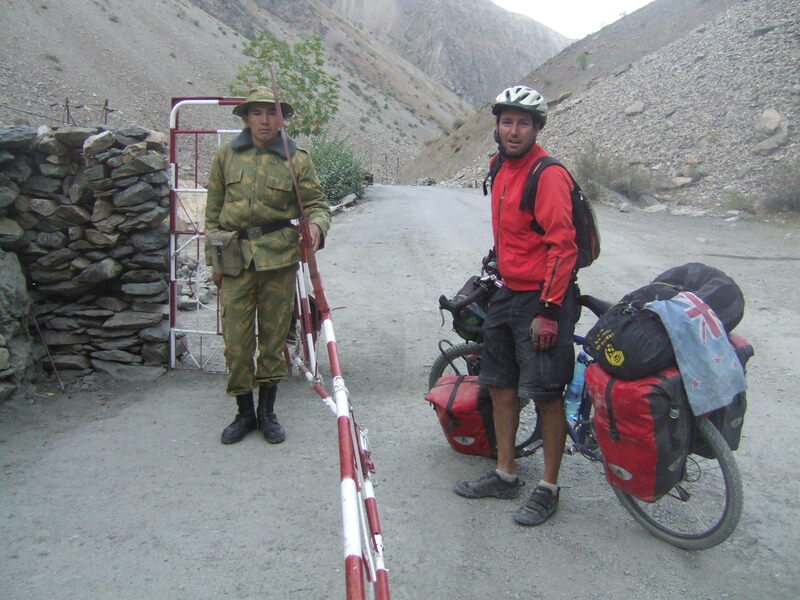 I was determined to make it up without having to push my bike – which I did. But I did have to stop to catch my breath a few times. My stomach was a bit sickly with the heavy workload and the breathing in of the traffic fumes. However, soon forgotten as I got a nice surprise which gave me a real lift when my friend Mel arrived with pompoms and a whistle to cheer me up the gorge. After conquering the gorge it felt like the hard work had been done and after less than an hour on the road I was stopping at a garden centre for a muffin and a cold drink and said farewell to Mel. From here on, it was now back roads and cycle ways. My legs soon became very tired and got even worse as I cycled straight into a strong Northern headwind. I guess the distinct lack of training didn’t help. Six bike rides in 2 years is not the ideal build up. But I was actually enjoying toiling away and felt like I was very quickly falling back into the routine. That soon changed between Pukarua Bay and Paekakariki. Cycling beside the sea, completely exposed to the wind I was having to work overtime just to achieve 5 km an hour while at the same time having to concentrate extremely hard, so as to be able to react quickly and stop myself being blown into the middle of the road. My normal cycling speed is between 15 km and 20 km an hour. When I reached Paekakariki I was completely exhausted and after a 25-minute break which turned out to be a mistake because halfway between Paekakariki and Raumati I got caught out on the highway in no man’s land and got drenched in a huge torrential downpour. I had nowhere to hide. Completely drenched and cold my enjoyment factor was now zero. I pushed on to Raumati where the roads were flooded and the Fire Brigade were out unblocking drains. I had arranged to meet my friend Peter in Raumati for some lunch and he had brought his bike with him from Wellington so he could cycle a few kilometres with me after lunch. Being the fair weather cyclist, we said our goodbyes in Raumati. Change of clothes and lunch didn’t help my legs……….they still felt just as tired. At least the sun came out and I also knew that I was very lucky because Kirsten and her mum Denise had gone out of their way to open up their holiday home for me to stay in. So on Day One I was a little bit spoilt and not having to rough it on my first night. I was going to be very lucky and very fortunate to be able to get a hot shower, a hot meal and the comfort of a proper bed. Happy. I won’t have to be roughing it just yet. Just after 8:30 a.m. on a lovely sunny but quiet Saturday morning I said goodbye to my friends and cycled back out to the main highway. Thankfully I got to start the day with a fresh set of clean dry clothes. For now I am sticking to the main highway, because I am under a bit of pressure and in a bit of a hurry to get to Auckland. I need to catch the container ship “Spirit of Shanghai” to Philadelphia in a little under 14 days. A good night’s rest didn’t do anything for my legs………..they were aching from the outset and weren’t that keen on cycling. 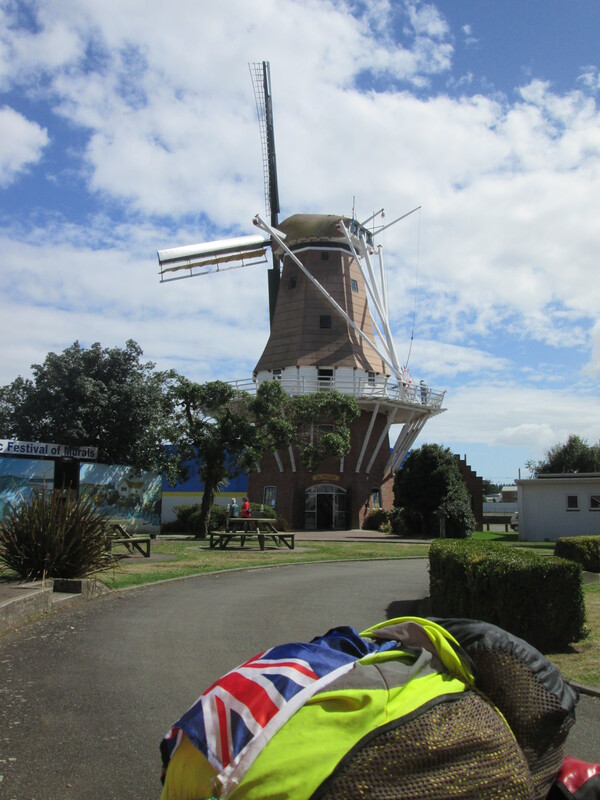 After a pretty slow morning (40 km in 4 hours) I stopped for lunch in Foxton another small town with a Dutch windmill as its focal point. I had pre-arranged to meet for lunch my friend Mike who rode out on his motorbike from Palmerston North to meet me. 14 km outside Foxton I got caught by my second storm in two days. It rolled in so quick I had no chance. At first I sort of sheltered under some nearby trees which wasn’t really working and the weather wasn’t letting up. So I went to a nearby house to seek refuge. No-one was home so I just waited it out on their front porch. Eventually I had no option but to push on in the rain. By the time I had got to Sanson I had had enough. I was tempted by the sign for $50 rooms……….but instead followed the signs for camping. At $12 a night it wasn’t too bad. I was again appreciative of the shower and the camp kitchen. I was able to cook up some sausages and rice. There was no-one else camping and the owner said I could leave my bike in the women’s toilet so as it would be out of the weather and to hang everything else up to dry off. Couldn’t have had a better test for my first night in the tent – there was a real good thunder and lightning storm with heavy rain. We came through the first night unscathed. 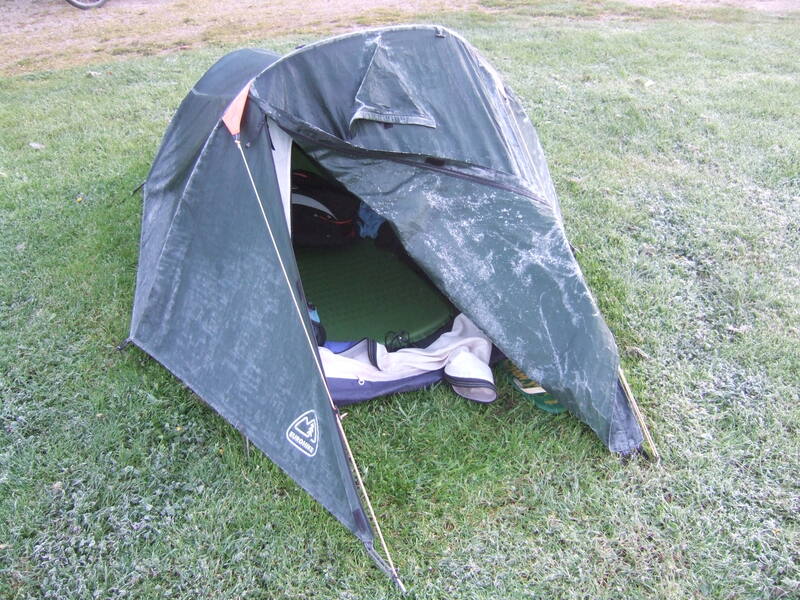 I survived my first night in the tent……but I didn’t sleep very well and it was difficult to find a comfortable position………..in fact I never did which led to a bit of a sleepless night. I knew the sun was up. But I didn’t want to move or open my eyes. I finally got on the road for 8:30 a.m. My first stop was the little country town of Bulls. I got some supplies from the supermarket as it was likely to be the only shop for the day. Heading towards Taihape I started to get my first real taste of hills. I wasn’t liking it one bit. I was really struggling. Halfway up a steep, steep hill I pulled into a driveway to get out of the sun and to rest my tired legs. A short time later a car pulled in and the driver said he was surprised to see me. We chatted for what seemed an hour – talking of travels. John is a retired shearer and had lived and visited many countries. He recommended a campsite a few kilometres up the road. Sounded good to me. Again I had had enough for the day and was ready to stop even though I had only cycled 70 km and was starting to fall behind my programme. 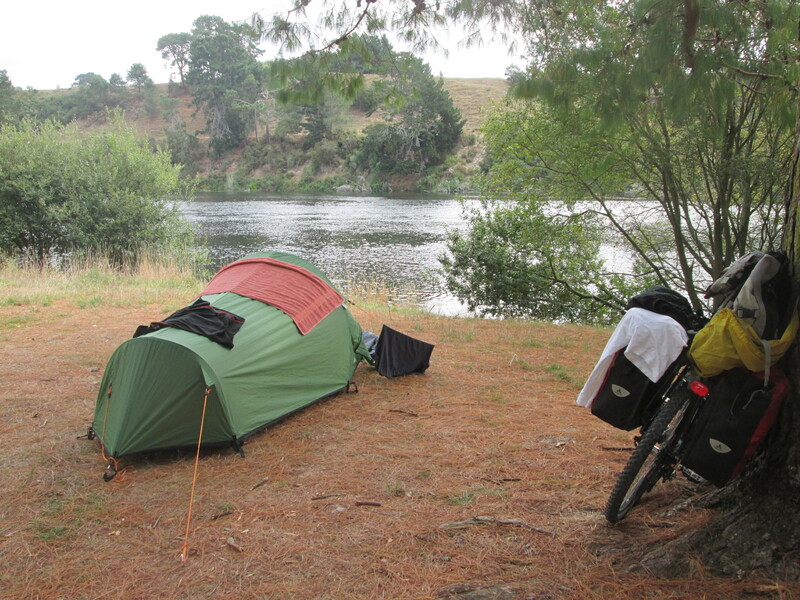 I cycled off the main road and into the quiet town of Mangaweka. It was like stepping back a few years. It’s one of the things I like about this trip, being able to visit “olde” New Zealand and soon it will be “olde” America. Following the signs for the campground my shoulders dropped when I started a 1 km downward cycle to the Rangatiki river and realised I was going to have to cycle back up the bloody hill in the morning. Hills are not my most favourite thing at the moment. It turned out to be well worth it. 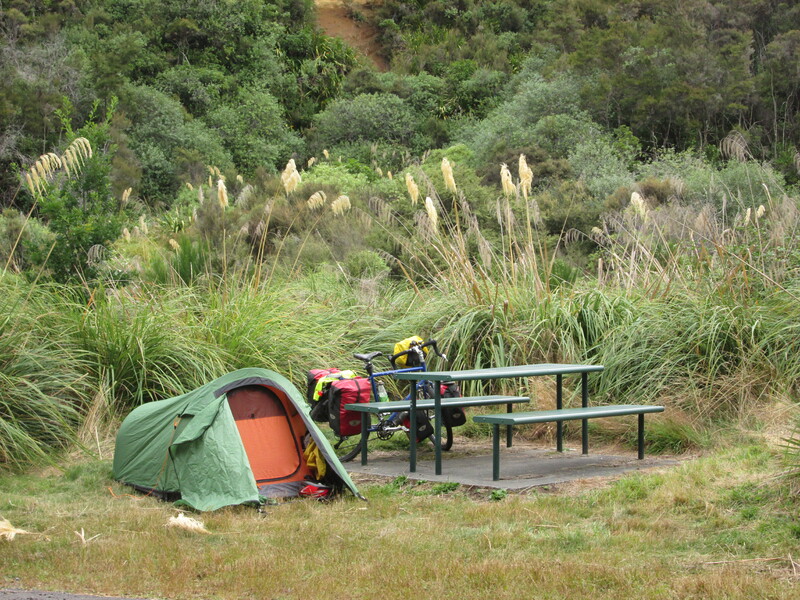 Camping beside the Rangatiki river with a backdrop of 100 metre chalk cliffs. To cross the river nearby was a 100 year old single lane wooden-planked cantilever iron bridge. I had no intention of cycling over it but I did walk across and back. 7:45 a.m. I finally managed to get myself on the road before 8 a.m. and was giving myself a better chance of getting in a good productive cycling day. I reached Taihape at 10 a.m. a little disappointed that I had only covered 20 km in the first two hours. 30 km was the norm on my previous trip. I guess the fact that it was all uphill didn’t help. Taihape is famous for gumboot throwing and I sat in the park to eat my morning tea and watch tourists try and throw gumboots. 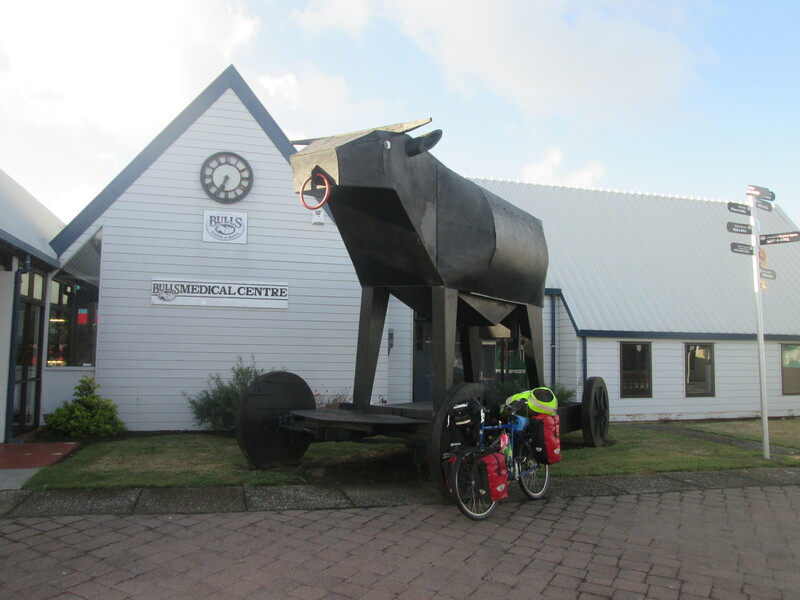 30 km on – I reached Waiouru for lunch. After lunch I entered the Desert Road. A 60 km stretch of nothing. It goes through an army training area across a plateau. Signs warn not to leave the road or enter the restricted area. By late afternoon I reached the summit, 1074 metres. The highest part of the New Zealand leg. I pushed on but wasn’t going to make it off the desert road by nightfall so at 6 p.m. I called it a day pulling into a rest area for my first night of wild camping. I found a spot for my tent back off the road and a little out the way. I don’t have a stove to cook on. I am waiting till I get to the US before I buy one. So for a quick and easy dinner I had brought some Subway at the last stop. Just as well it was quick because the sand flies were out in force. There were a few cars and trucks that pulled into the rest area during the night. But no-one bothered me. Yesterday when I cycled across the Desert road Mount Reuapahu and Mount Nahahoe were both hidden by cloud. At least this morning some of the cloud had lifted and I got a glimpse of some snow on the side of Ruapaheu. At Turangi I turned off the main highway and headed west around Lake Taupo. Quieter road with less traffic. In return I got hills and more hills. Had a nice view of the lake as we climbed. The area is very geothermal, and there were pockets of steam coming from the hillside. There were a lot of hills, but for the first time I found the hill climbs a lot easier. I was able to do more kilometres today as well. After only a very short time the fitness is already coming back. There has been a variety of daily road kill………..and at cycling speed you get a good whiff followed by a good look. To date there has been possums, rabbits, hedgehogs, ferrets, Pokeko (native NZ bird),a cat, a dog and today there was a sad sight of what I think was a New Zealand Falcon. 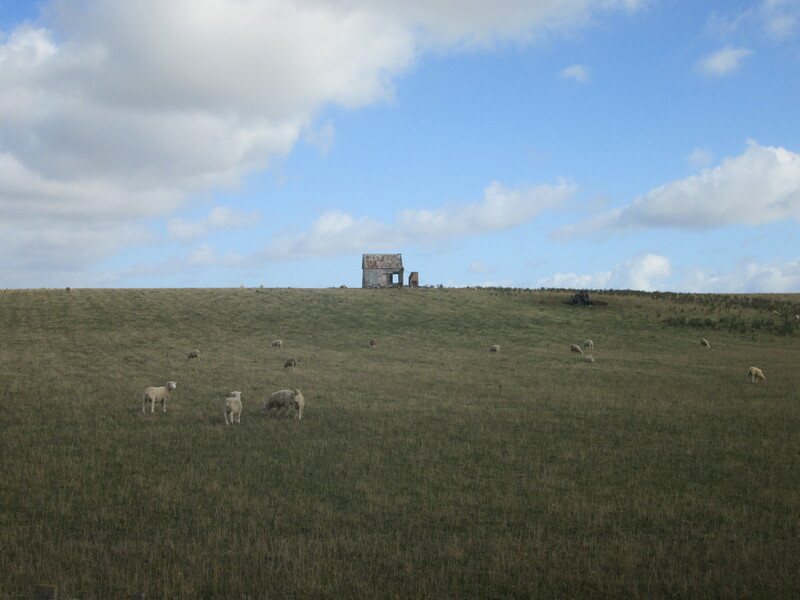 Earlier in the day I was passing through miles of forest and prime wild camping spots. But as the day went on , the camping spots were looking scarce with the amount of farmhouses around. I was getting a bit desperate so when I came across a sign for a bed and breakfast I went up and spoke to the owner. 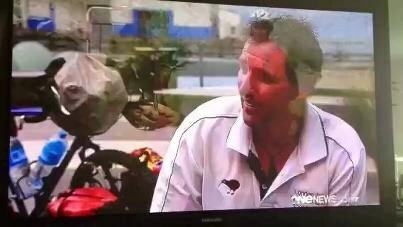 I suggested that the B & B was probably out of my league but asked if it would be okay to to camp in the front paddock. I also mentioned I was exhausted and that it was going to be dark soon. It wasn’t a problem and that is where I put my tent for the night. After 5 days with constantly aching and hurting legs, the discomfort simply went away. I guess my legs finally gave up on the idea of trying to discourage me. At mid-morning I rejoined the busy state highway 1 at Tokoroa. Being the organised and experienced long-distance cyclist, it is slightly embarassing to say I left home without any chain oil. After a few days of rain the chain was now in need of some lube. I called in at the local bike shop and they were great giving me a 33% discount and throwing in some Energy Gums as well. I was really grateful for their support. 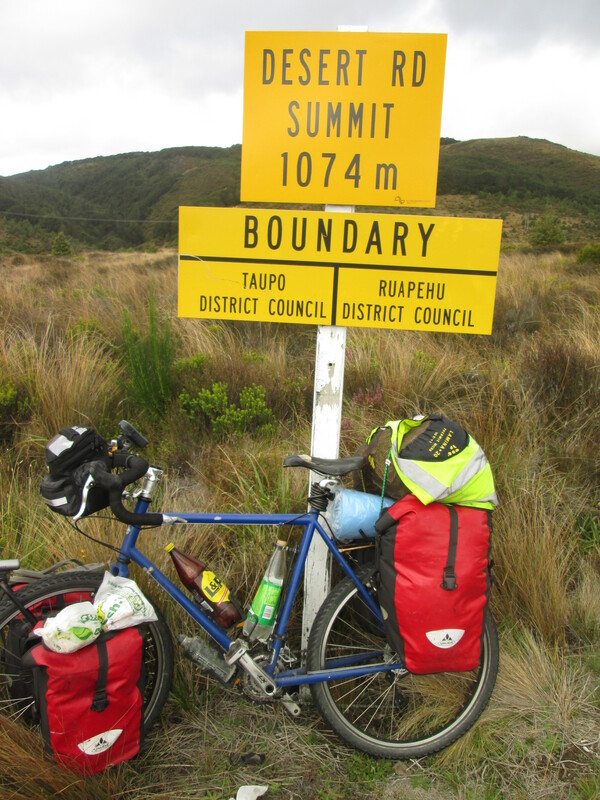 I had more success with a small bike shop in Tokoroa than any other bike shop in Wellington. Instantly with a bit of lube, I picked up the pace. The bike travelled so much better. At Putaura I picked up a Chinese take-away for dinner and some helpful info from the tourist office, who directed me on a back road to the Little Waipa reserve camping area next to Lake Karapio. It was only 18 km up the road, So 3:30 p.m. was a good time to be stopping . It enabled me to enjoy a relaxing afternoon by the lake. I also took the chance to have a swim which was my first real wash in quite a few days. The first stop for the day was in the horse-racing town of Cambridge. 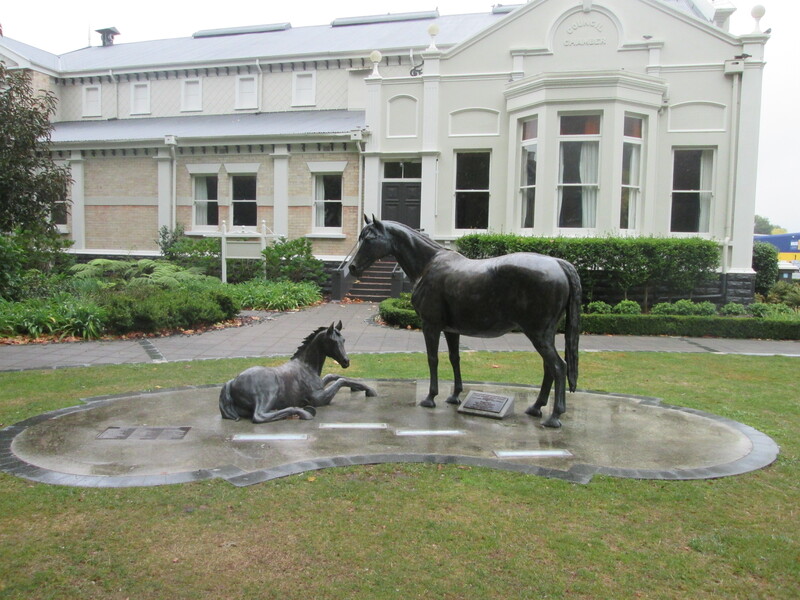 The main street had a walk of fame with tiled portraits of famous horses inserted into the footpath. I got to stay a little longer in Cambridge with the onset of rain. I tried to see it off. In the end had to push on and got a little wet for it. At least it wasn’t too far to Hamilton. Only another 30km. 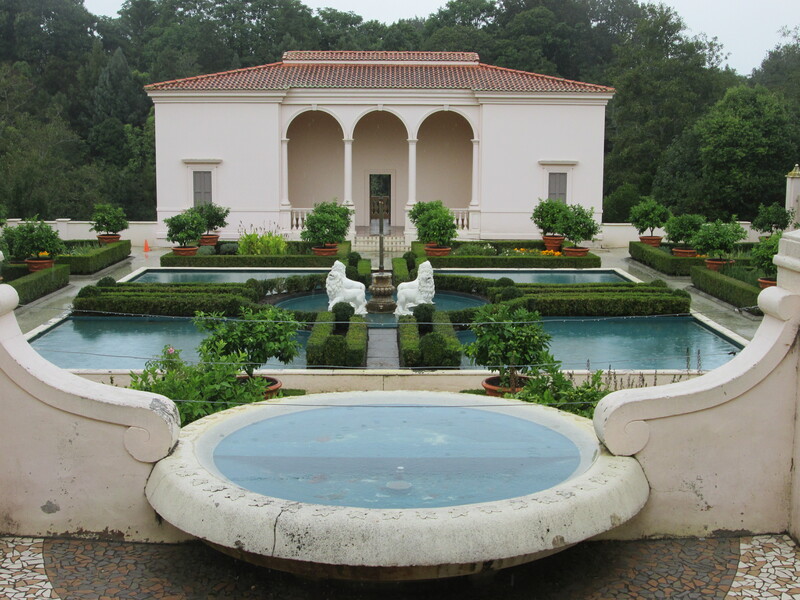 I spent the afternoon at the Hamilton gardens while I waited for my friend Helen to finish work. They are really well done with a number of themed areas, Japanese garden, Tudor garden, American, Chinese and New Zealand. I started today with the plan of getting about 70 km from Auckland to allow a realistic and not too difficult ride into Auckland tomorrow. I started off cycling out of Hamilton on the cycle way before jumping on the express way. A cycle lane has been put in the hard shoulder. It was a good fast surface to cycle on and I very quickly started to knock off the kilometres. I was in Huntly for morning tea and by 11:30 a.m. I had done 70 km and was at Pokono services. This was where I had planned to stop for the night. But since it was so early in the day I decided to go for it. The first hurdle was getting over the steep Bombay hills. By the time I got to the top it was a stinking hot day. Got to the Welcome to Auckland sign but it was still a few hours to South Auckland. I was no longer allowed on the Express way so the pace slowed on the back roads. 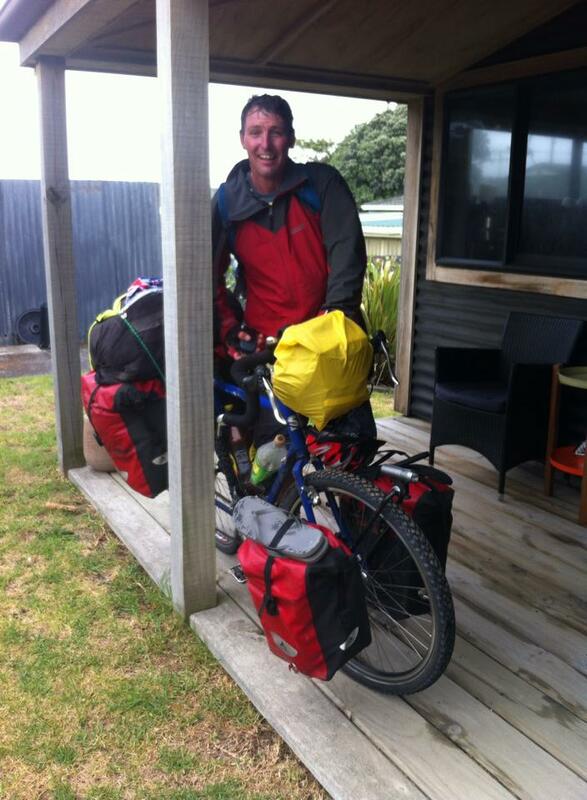 Then I got news from my friend Chris who lives in West Auckland………..another 30 km away. I had to navigate through busy Friday afternoon traffic. By the time I reached Chris’ it was 8:15p.m. It had been a huge day, I was exhausted, but I had come through it well. 157 km was a few more kilometres than I had planned. But I was pleased that after just 8 days I had reached Auckland and that I was getting back to my best, fitness wise and mind set. The last few hours I was running on empty – was out of water and food but was able to push on. Certainly what helped was that there was a dangling carrot. I had something good to work towards – Chris and Cats cooked me a very nice meal of steak and salad and I was back in a proper bed. After yesterday’s big day. I was sort of in the mind set of job done. In fact, I had to relocate another 30 km over to Coatesville on the other side of Auckland where my cousins Janet and Paul live. Kim Dot.Com lives just up the road. Problem was I was in relax mode and enjoying just chilling at Chris’. After procrastinating I finally got back on the bike at 2 p.m. to join the busy Saturday Auckland traffic. I don’t mind the traffic too much because the bike is quite wide with the panniers and I feel slightly protected. I had to work on the cycle over with some hills on the way. Good thing is I am off the bike now till Friday. Then I will just have a morning ride to meet the “Spirit of Shanghai”.